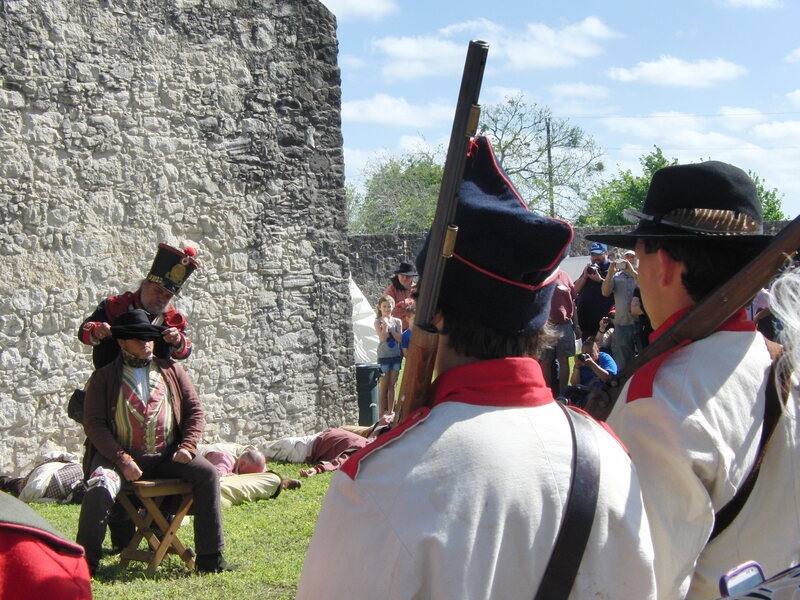 On March 27, 1936, during the Texas Revolution and less than a month after the fall of the Alamo, Santa Anna ordered the execution of Colonel James Fannin and almost 350 of his men who had been captured 7 days earlier at the Battle of Coleto Creek. 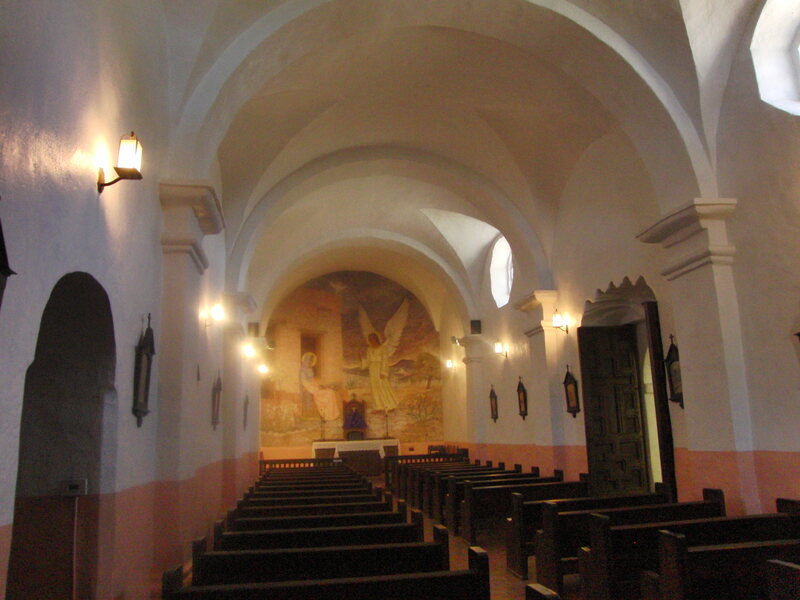 Being held inside the small chapel at the Presidio La Bahia, the men were marched out to meet the firing squad, and within the walls of the Presidio La Bahia, the shots rang out. 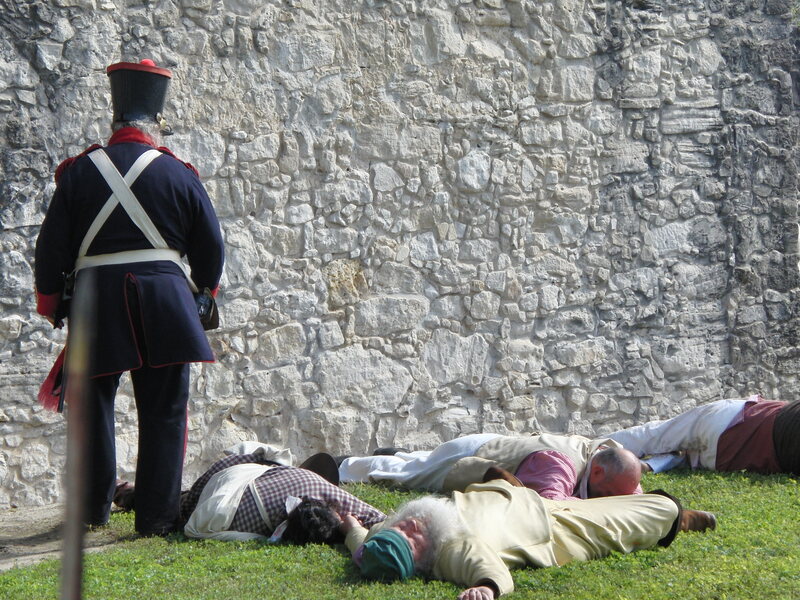 Almost 180 years later, we stood on the very spot watching the annual reenactment of the Goliad Massacre. As amazing and moving as the reenactment is, there’s much more to the story of the Presidio La Bahia. 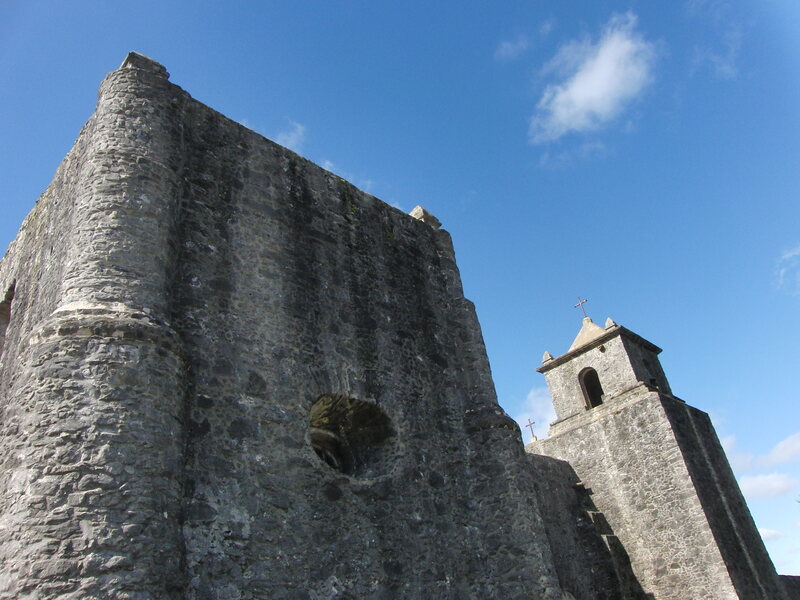 The Presidio La Bahia was constructed in 1749 as a Spanish Fort. 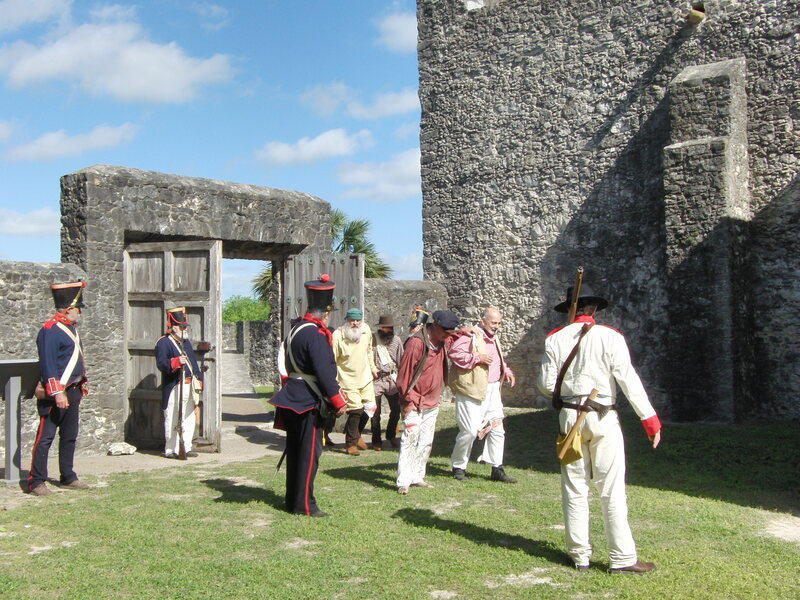 It is the oldest fort West of the Mississippi River, and was active in 6 revolutions, including the American Revolution of 1776, when the Spanish assisted the Americans in fighting the British along the Gulf Coast. 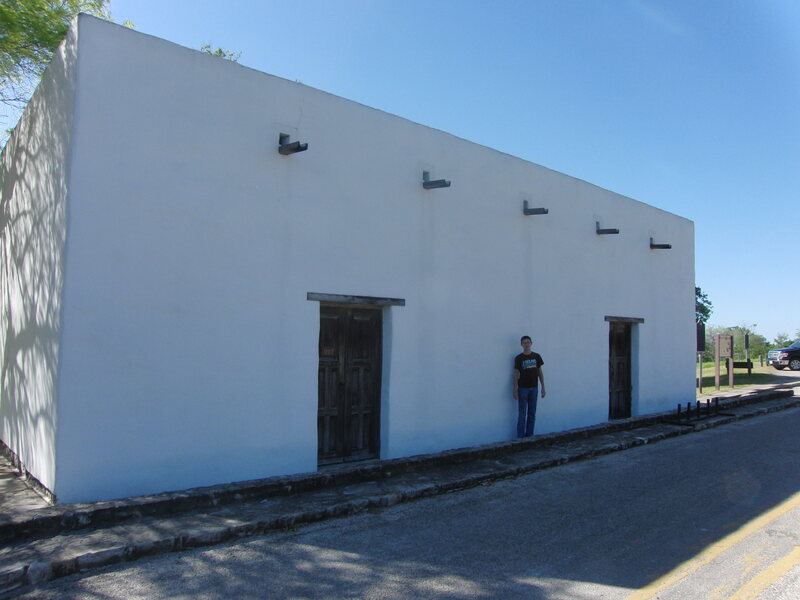 Visit the museum inside the Presidio La Bahia to see many artifacts that have been discovered during archeological digs, as well as other items on exhibit. 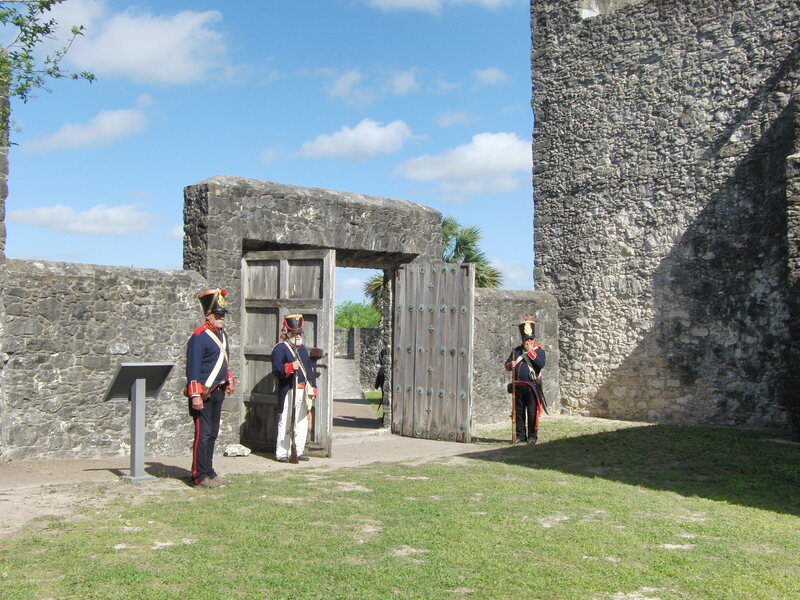 The museum is housed in one of the fort’s original officer’s quarters. Take a walk inside the grounds of the Presidio. 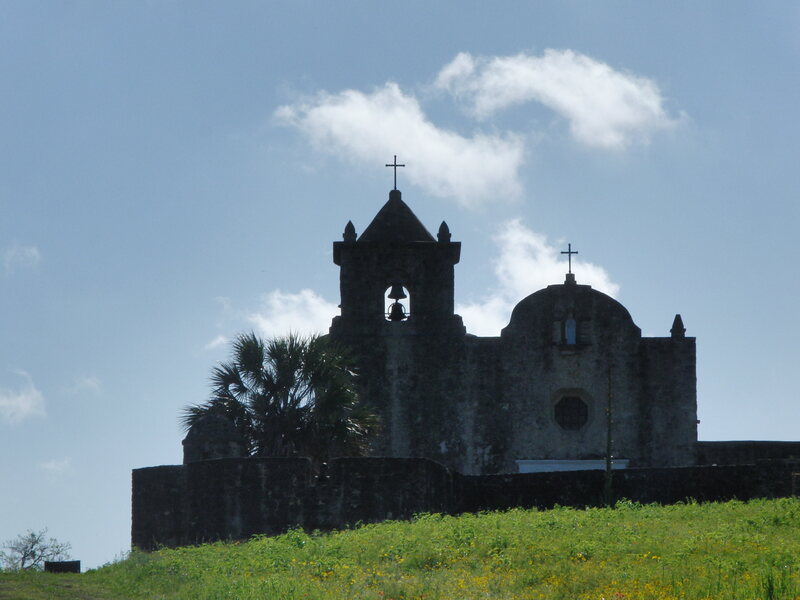 Built as a place of worship for the soldiers of the Presidio La Bahia, it’s where the first Texas Declaration of Independence was signed in 1835, predating the one signed at Independence Hall at Washington on the Brazos by almost 4 months. 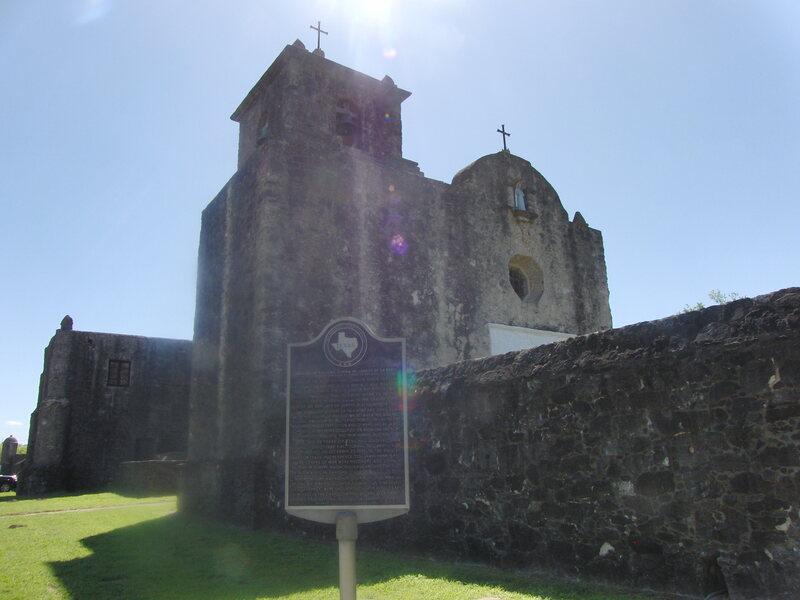 The men flew a flag depicting a bloody arm and sword, called the Goliad flag. 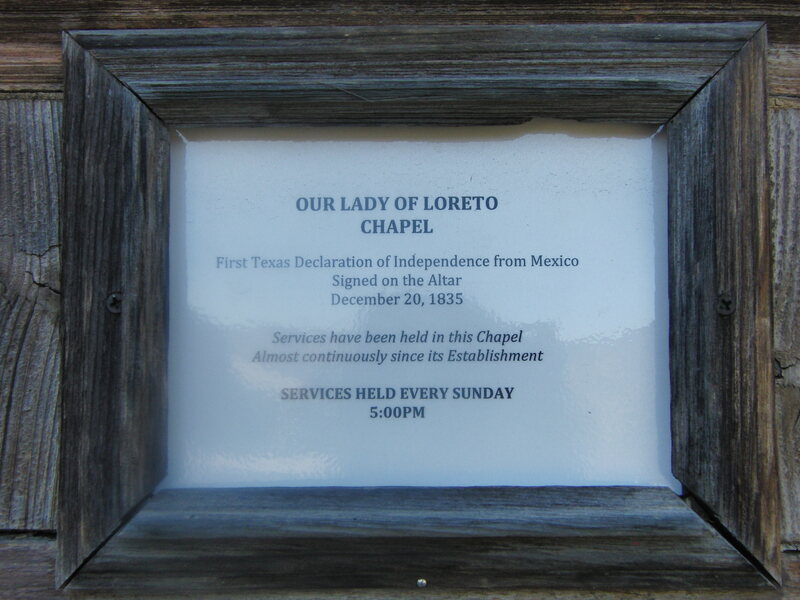 In addition to weekly church services, the Chapel is also often used for weddings. I’ve begged all three of my children to be married here. 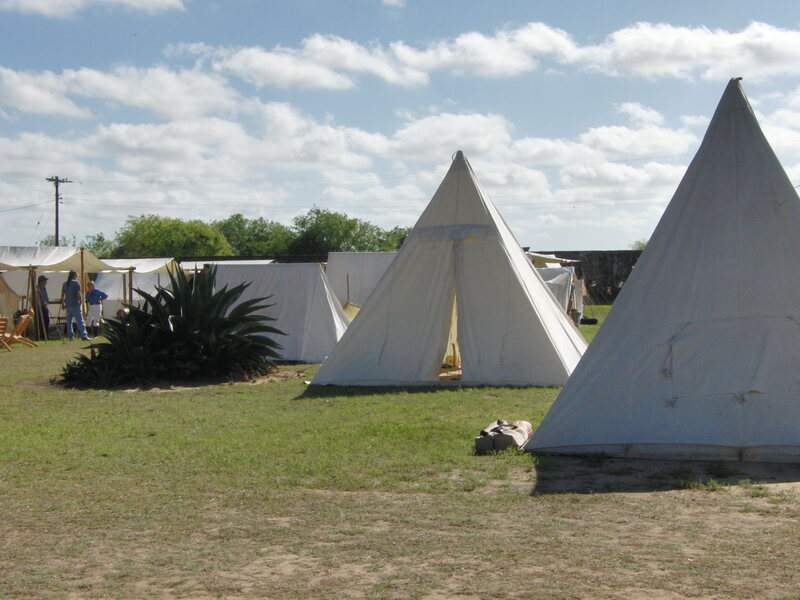 Make your visit really memorable by spending the night at the Presidio La Bahia in one of the original officer’s quarters! It’s very popular, so call in advance to make your reservation! This is definitely on my Bucket List! Click HERE for more information, to see pictures of The Quarters and schedule your visit! 7. 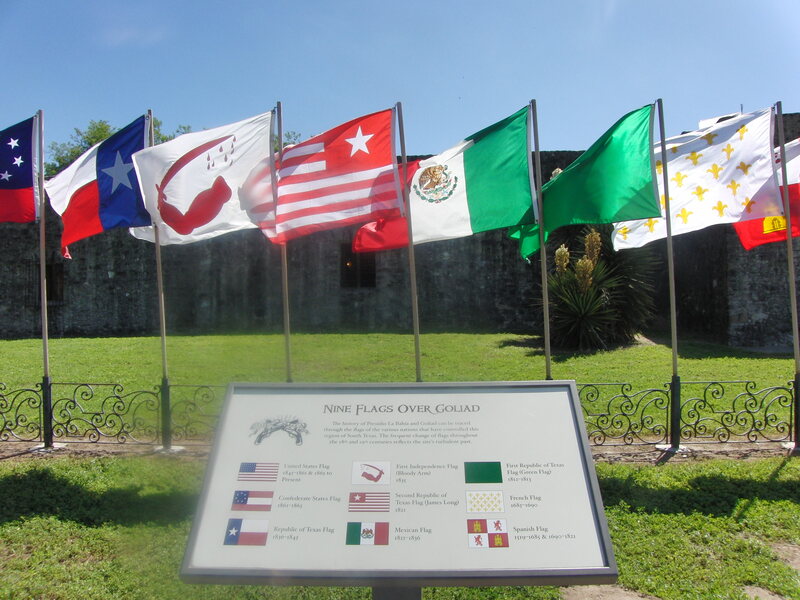 The nine flags over Goliad. 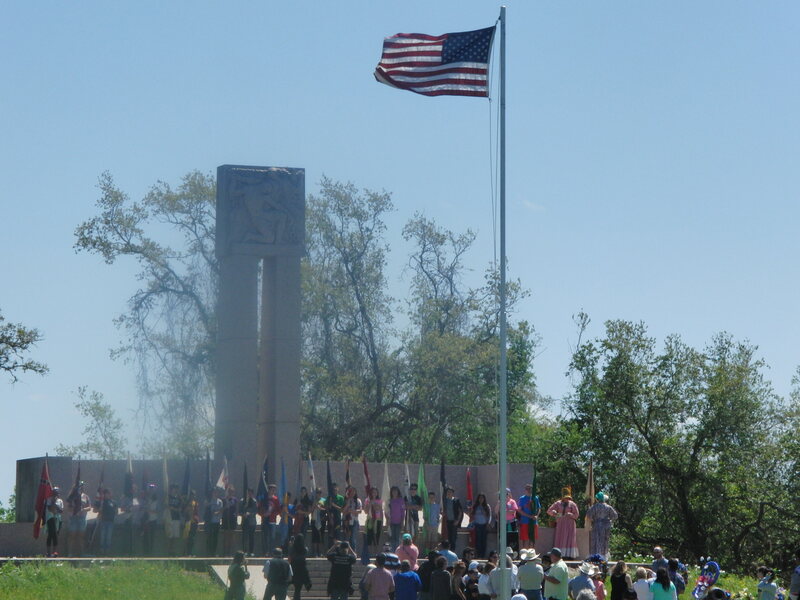 See the nine flags that have flown over Goliad, including the Bloody Arm and Sword Flag. Another request Fannin made of his captors was for a Christian burial, but he along with many of the other Texians were burned. When Texian General Rusk came through, he had all their remains gathered and buried. A large monument marks the sight of their mass burial. 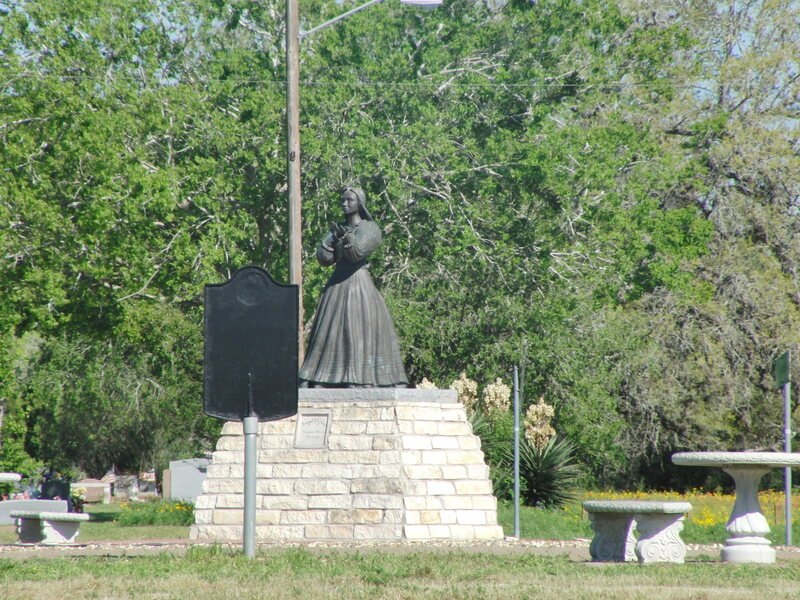 A monument pays honor to Senora Alavez, known as the Angel of Goliad. 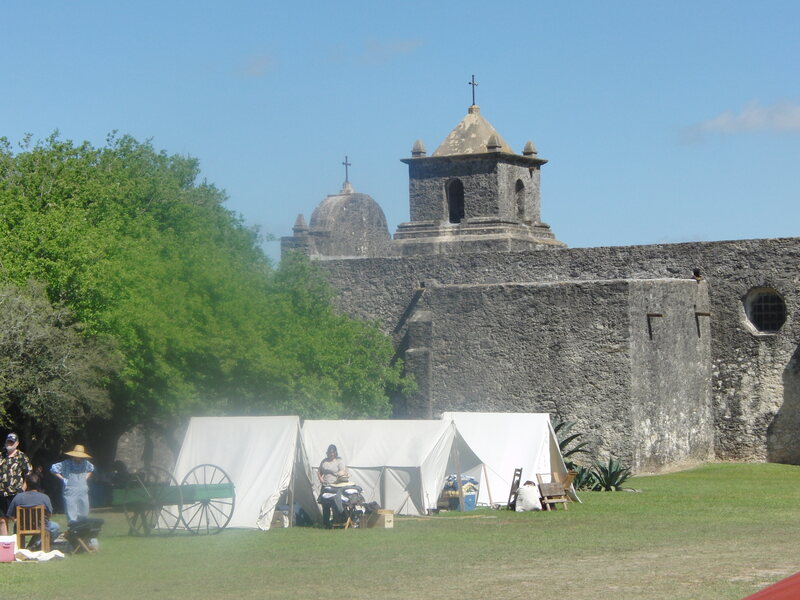 Traveling with a colonel in the Mexican Army, she was responsible for pleading and saving the lives of about 15 Texians in Goliad, and later Isaac Hamilton in Victoria. 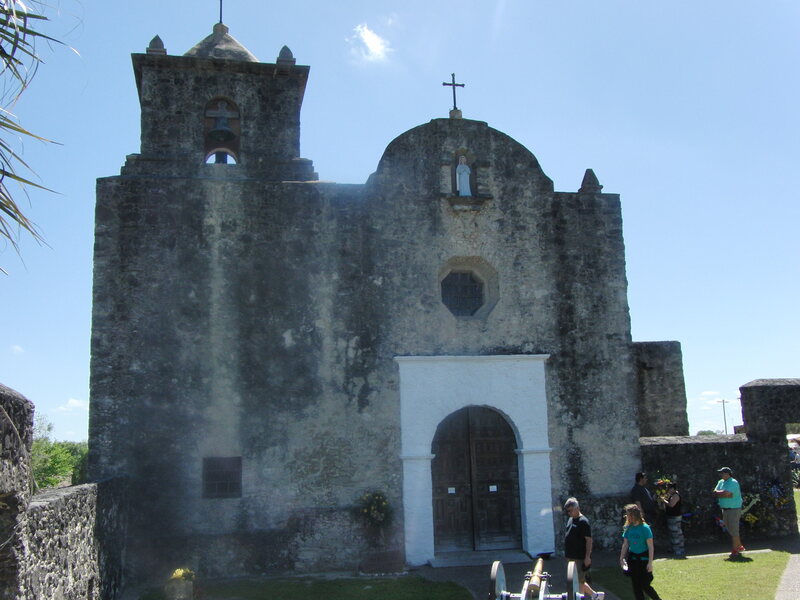 During the annual Goliad Massacre Reenactment, many of her descendents visit, and pay a special memorial to her. 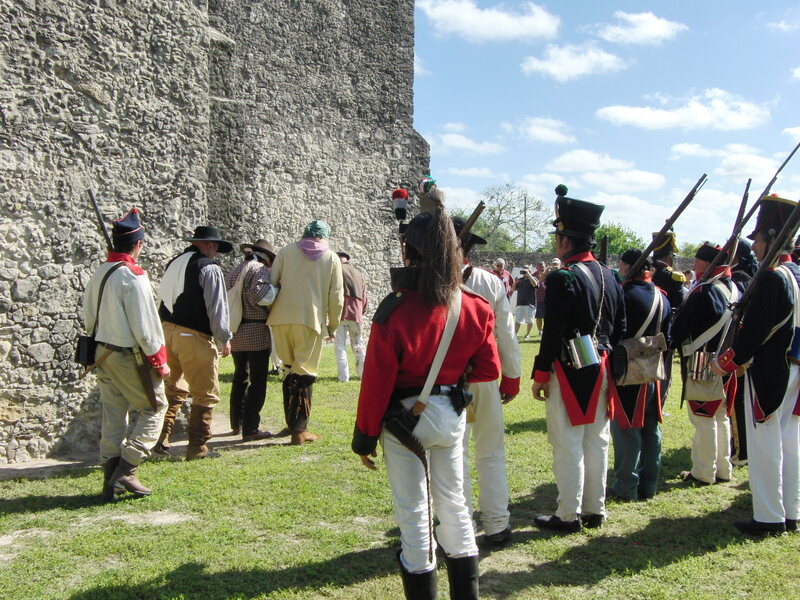 Each March, about 5000 people attend the annual Goliad Massacre Reenactment. The morning begins about a 1/2 mile from the Presidio, watching as the Texians under Colonel Fannin are overwhelmed and taken prisoner by the Mexican army under General Urea. 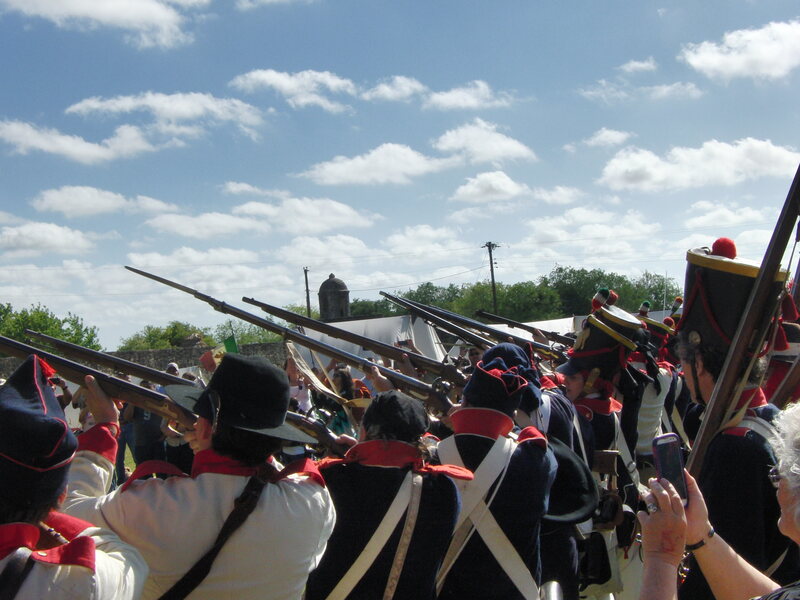 Follow as Colonel Fannin and about 350 men are marched back down to the Presidio. About 20 minutes later they are marched out of the small chapel where the men were originally held, weak from 7 days with little food or water. In reality, the men were divided into 4 groups, and the 3 largest taken outside of the Presidio to be executed. The wounded were the only ones executed inside the walls. Believing they are to be released or taken to Mexico, the actors portray the fear and courage of the men as they realize their fate at the hands of the armies firing squad. As the guns take fire, I remind my young 7 year-old that this is all pretend. After the men are shot, Colonel Fannin is the last to be brought out. Considered a vain man, he attempts to bargain with the officer, asking that he be shot in the heart, and not the face. After agreeing to the proposal, the officers orders his men to shoot Fannin directly in the head. Colonel Fannin, injured in the leg, was actually executed in this same spot. 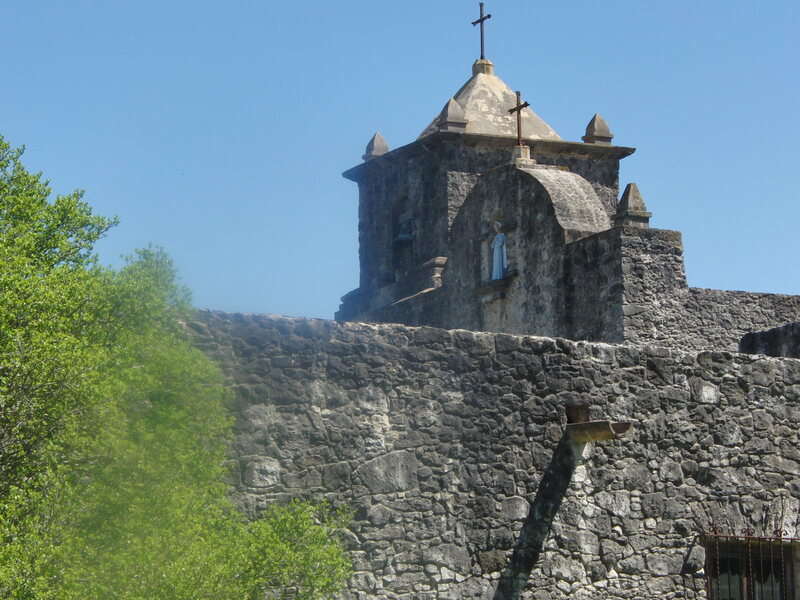 Following the Fannin execution, Isaac Hamilton then tells his story of escape from Coletto Creek, only to be caught in Victoria by the Mexican Army, and how The Angel of Goliad saved his life. 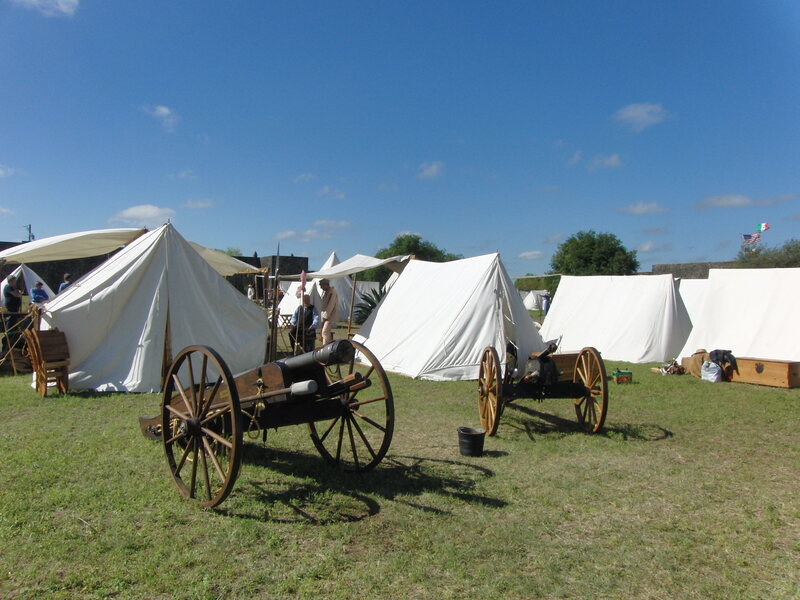 Following the reenactment, you can walk around the tents used by the reenactors. 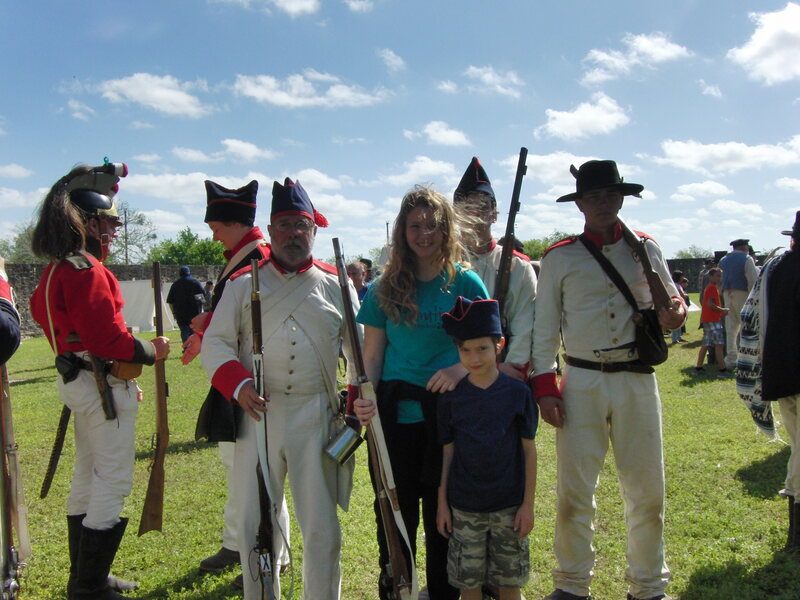 The reenactors happily stand with the visitors for photos, even letting my daughter hold a gun and my son wear one of the Mexican army hats. 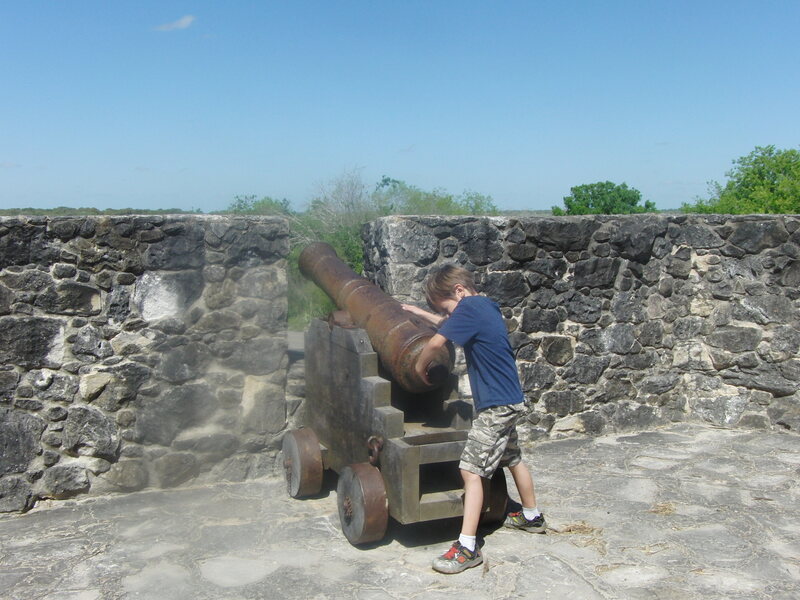 My family enjoys reenactments because they are an invaluable way to learn about the history of our state, but I also just really like to watch cannons fire. A huge circle of smoke comes burst from the cannon, and as it drifts upwards holding it’s shape it’s beautiful, and hard to believe something like it could cause so much destruction. Following a service in the chapel, you can follow along as they march to the Fannin Memorial, where the remains of the Texians are buried. 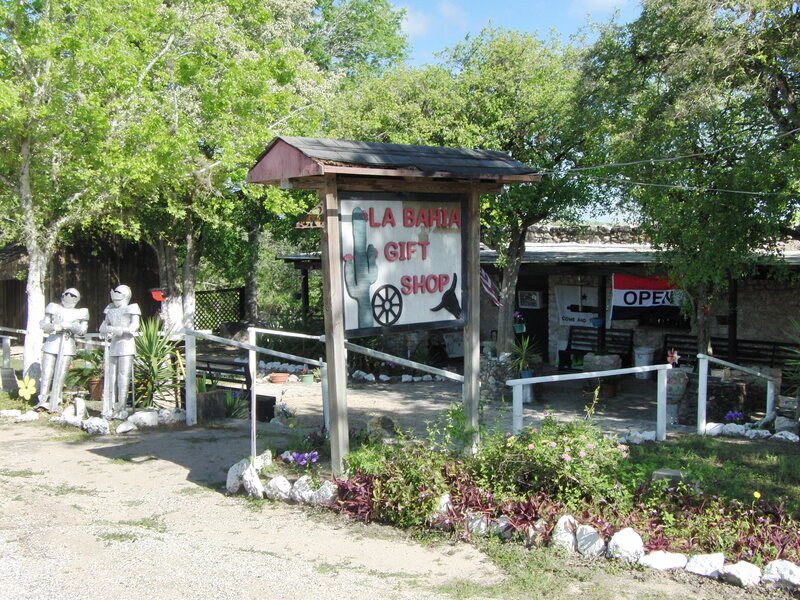 Visit the La Bahia gift shop for souvenirs. Zaragoza’s Birthplace is at the Presidio La Bahia.